Personalised Commissions have been a steady source of work over the last 5 years. I strive to work closely with the client to produce artwork that is bold, creative, and suits their needs. Commissions range from personalised gifts, T-Shirt designs, album artwork, and even event banners. Below is the short list of pieces I have done over the last 3-years, showcasing my diverse range of options and abilities for design personalised artwork. When working with clients, I first like to establish the objectives of the piece to be done. This can be done either in person or often entirely through email. I also have the client fill out a document that can help them (and me) conceptualise just what they're looking for (gift, T-shirt design, monument to celebrate your own glory, etc. ), as well as a time frame for completion. All consultations are free of charge. *Final pricing is determined by the nature of the project, its complexity, and time sensitivity. *Each project is unique, but a flat rate of $280.oo is applied as a baseline to all projects. Once I've had the opportunity to learn more about the project, I generate a series of sketches for the client to review. Sketches and outlines of the project incure a $50.oo fee, irregardless if the project moves forward. Once the client is happy with the rough sketch outline, I then proceed with the final Image. Depending on complexity and time sensitivity of the project, I try to produce project updates at least weekly to give the client plenty of opportunities to comment and add suggestions as things move along. *Sketches = $50.oo (included in final price). * Weekly progress updates, so you can be sure you're getting what you want. Once artwork is finished and all decisions and payments are finalised, the client (depending on the nature of the project) will receive a full resolution file of the artwork, a web friendly .jpg (for sharing on social media or online), and a Print Ready CMYK file. Printing arrangements can also be made for the final product, and will incur costs depending on quality and size. *Full resolution and Print Ready .pdf, .png, .tiff, or .psd file upon completion. *Also includes a Web friendly .jpg. For other options, just ask! *Printing options available (at extra cost). *Sorry, framing options are NOT available. The bride’s husband is a HUGE Spider-Man fan, and she wanted to get him a unique piece of art that captured the thrill and action of the web-slinger, as well as put them in the image. With some creative problem solving, I was able to do both. A very fun piece. War Hammer 40k "Winter Slayer" event banner. Commissioned for a annual event held at Jolt Games in Canberra. This piece depicts a couple Space Marines battling back a horde of Necrons, using the destructive power of Heavy Metal. A fantastic piece to work on. Artwork commissioned for local Canberran metal band "Bleakwood", the client wanted the image of a Raven as the central focus. I used a variety of natural landscape photos, a few different Raven images stitched together, and a lot of layering of color to achieve this dark, brooding piece. 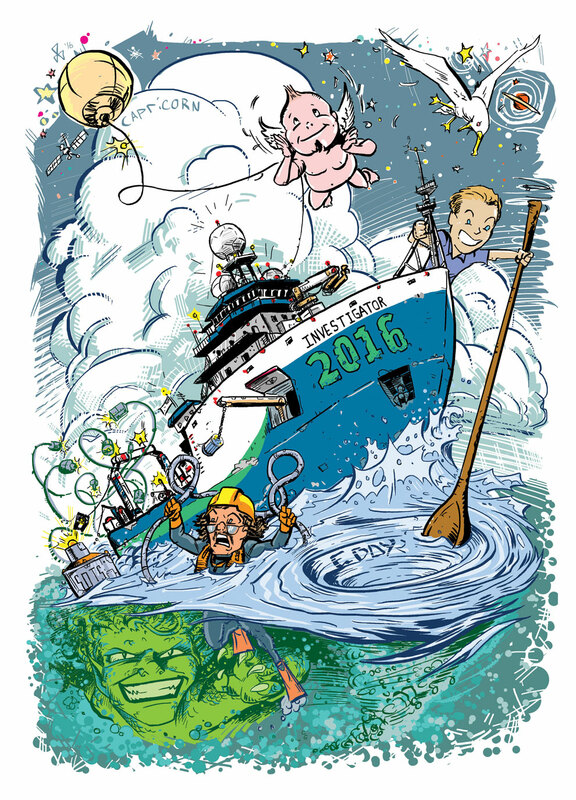 A fun, commemorative piece produced for the science crew aboard the Antarctic Research vessel the "Investigator" during one of its 2016 voyages. The trip was apparently fraught with mishaps, entangled buoy lines, and blasting storms. All in a hard days work. Feel free to contact me if you'd wish to discuss a personalised art piece of your own!